LA JOLLA, CA--(Marketwired - June 24, 2015) - Sanford-Burnham Medical Research Institute (Sanford-Burnham) announced today that it has received a gift of $100 million from prominent San Diego developer, philanthropist, and Sanford-Burnham honorary trustee Conrad Prebys. This is the largest donation ever made by Prebys and will be used to further implement the Institute's 10-year strategic vision to accelerate the delivery of innovative new treatments that will have a tangible impact on improving human health. "A gift of this magnitude is significant in many ways," said Sanford-Burnham Chief Executive Officer Perry Nisen, M.D., Ph.D. "It enables us to conduct translational research to advance laboratory discoveries and clinic-ready drug candidates further along the development pipeline, progressing toward therapies, preventions, and cures for patients who desperately need them. We are profoundly grateful to Conrad Prebys for this extraordinary gift." In recognition of Prebys' contribution, Sanford-Burnham Medical Research Institute will now bear his name, along with the other Institute namesakes T. Denny Sanford and Malin Burnham. Effective June 24, the new name will be Sanford Burnham Prebys Medical Discovery Institute. "We are honored that Conrad Prebys' name is now part of ours," said Sanford-Burnham President Kristiina Vuori, M.D, Ph.D. "He has a longstanding relationship with the Institute and believes strongly in our mission. Nearly a decade ago, his first gift helped us establish the infrastructure for drug discovery research. Today, Conrad's generosity will take us even further. We are in the golden age of biology, where advances in molecular biology, robotics, imaging, and many other technologies allow us to ask and answer previously impossible questions. Now more than ever, we have the capacity to speed up the process of moving medical research discoveries from bench to bedside." 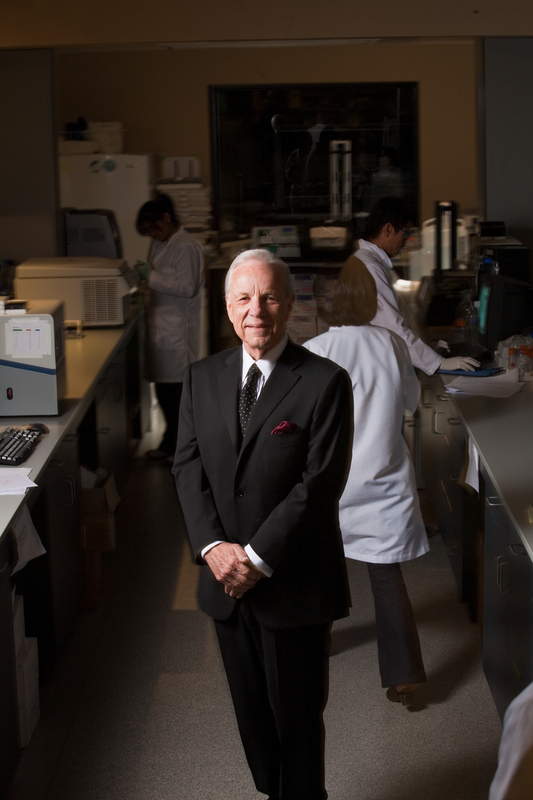 Sanford-Burnham's plan to form more pharma and clinical partnerships in order to advance translational research discoveries that will have a tangible impact on human health is critical to philanthropists like Prebys as they consider which organizations to fund. "When it comes to finding cures, Sanford-Burnham is the engine that will drive innovation," said Prebys. "I've been involved with the excellent researchers at the Institute for many, many years. They're the best there is, and that excites me. If, through my support, I can shorten people's suffering, or extend their quality of life, that would give me unlimited pleasure and joy." Prebys previously donated $11 million to the Institute, including $10 million in 2009 to support the Conrad Prebys Center for Chemical Genomics. His investment in the ultra-high-throughput chemical screening center helped establish the drug discovery platform that is critical to Sanford-Burnham's new emphasis on advancing laboratory discoveries to clinical study and gaining commercial interest in Institute assets. Last year, Sanford-Burnham received a transformative $275 million gift from an anonymous donor. Including the Prebys gift, the Institute has received more than $375 million toward a $500 million, 10-year fundraising goal. Since 2014, Sanford-Burnham has received two of the five largest philanthropic donations to medical research in California. Prebys' latest gift will help build sustainability for research and development, and further the Institute's work in its focus disease areas of cancer, neuroscience, immunity, and metabolic disorders. A native of South Bend, Ind., Conrad Prebys was raised in a working-class, blue-collar neighborhood, where few aspired to go to college. When he was eight years old, he developed a heart condition and was informed that he would lead a sedentary life. He focused on music as a future career choice. The turning point in his life was an inspirational teacher who exposed him to the arts and encouraged him to further his education. He was the first of five brothers to attend and graduate from Indiana University. In 1966, Prebys co-founded Progress Construction and Management Company, a developer of real estate enterprises in California and Texas. Named by Business Insider as one of the "25 Most Generous People in America," Prebys has given more than $160 million (in addition to the current gift) to a variety of causes since 2005. His generosity has included capital and operating gifts to the Boys and Girls Clubs, the San Diego Zoo, the Old Globe Theatre, UC San Diego Music Centre, the La Jolla Music Society, Scripps Mercy Hospital, the Salk Institute, San Diego State University, San Diego Museum of Art, Masterpiece Theater, and Sanford-Burnham Medical Research Institute.